Clinical research and experience over the last thirty years indicate there is a separate comprehension weakness that is rarely identified. This weakness often undermines the reading process…It is weakness, based in the sensory system, in creating an imaged gestalt. Michelle reads words accurately, but she doesn’t understand what she reads. Words seem to “go in one ear and out the other” and she struggles with following directions. Her parents express frustration about her weak short term and long term memory. Her teachers think she is not trying, and she has been labelled as having ADHD. A primary cause of language comprehension problems is difficulty creating an imagined gestalt. This is called weak concept imagery. This weakness causes individuals to get only “parts” of information they read or hear, but not the whole. Individuals of all ages may experience the symptoms of a weakness in concept imagery. 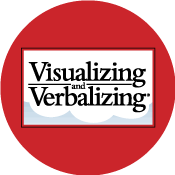 The Visualizing and Verbalizing® (V/V®) program develops concept imagery—the ability to create an imagined or imaged gestalt from language—as a basis for comprehension and higher order thinking. The development of concept imagery improves reading and listening comprehension, memory, oral vocabulary, critical thinking, and writing.